"(of the) intellectual, stimulating sermons that allow and challenge us to grow but never lock us into dogma." "the acceptance of differing religious backgrounds and lifestyles." We are a small, open and affirming Protestant Christian church. Because we fall into the category of a small church (approximately 75 members), we are more relationship-oriented than program-oriented. This is a church where literally every single person (who is active) knows every other person in the congregation. This provides a strong sense of community. We hold each other in our prayers and provide a broad base of support to shut-ins and people who are going through difficult times. We fall toward the liberal side of the theological spectrum. Our members are of many different theological persuasions and come from many different religious backgrounds. We have members who were raised Congregational, Baptist, Methodist, Episcopal, Quaker, Seventh Day Adventist, Unitarian, Presbyterian, Greek Orthodox, and Roman Catholic. We have several members who did not benefit from any specific religious upbringing but came to Christ on their own and have found their way to our church. We believe in the power of prayer. We have an active prayer chain and a prayer list that is included in our bulletin every Sunday. This prayer list is comprised of members or friends of our church family who are in special need, whether short term or long term. Although we are nondenominational (not directly affiliated with any specific denomination), we were founded as the Second Congregational Church of Southborough in 1865, and our church polity is consistent with congregational church polity. Because of the diversity we celebrate within our church, we support the ecumenical and interfaith activities of the various churches in our community as active members of the United Parishes of Southborough, both on the clerical and lay level. 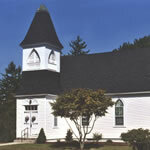 We participate in the United Parishes Thanksgiving service, Lenten series, and Easter Sunrise service, in addition to supporting the Southborough Food Pantry. We have a reputation for our wonderful coffee hours following the worship service - not only for the food but the fellowship. It is not unusual for people to linger at our coffee hours for an hour or more as they enjoy each other’s company and the good food that is always part of our fellowship! We are known throughout the community as "The Little Church With a Big Heart." We are a warm and welcoming community. We are inclusive, open, and affirming with regard to people of various backgrounds. Our Vision Statement: “We are a community of faith, believing in the power of prayer and seeking earnestly to deepen our spiritual lives and share the love of God with others."